MOUNT VERNON, Iowa – The Cornell Mock Trial team recently arrived back to the Cornell College campus with a 7th place trophy. During the weekend of April 15 – 17 the team competed at the American Mock Trial Association’s 32nd National Championship Tournament. “I am thrilled, not just for the students who actually competed at the National Championship Tournament, but for our whole program,” said Cornell College Mock Trial Head Coach Abbe Stensland. Only the 48 best teams in the country competed, many of which were large universities and state schools. “When we can travel across the country, compete with some of the biggest schools and still come out on top, it’s an incredible feeling. To know we are a small private school in Iowa, and one of the best programs in the nation, is a point of pride for all of us,” said Mock Trial Team Member Kenny Capesius ’16. Seven students competed, but others helped the group of seniors prepare. Those who took part in the National Championship include: Capesius, Maria Goodfellow ’16, Evan Andersson ’16, Nora McKenzie ’16, Sarah Bertschy ’16, Kahn Branch ’16, and Chris Machold ’16. Cornell’s team has a history of doing well during tournaments. Stensland said in the ten years the team has been in existence, it has qualified for the National Championship Tournament seven times. The Cornell Mock Trial program is currently ranked 35th nationally out of more than 600 teams that register to compete with the American Mock Trial Association. “To put this in perspective, collegiate mock trial is not tiered like college athletics. This means that Cornell’s mock trial team competes against large state schools like The University of Michigan and UCLA, Ivy League schools like Yale and Harvard, and everything in between. Cornell is the smallest school by student population to rank in the top 50 teams in the national rankings,” Stensland said. No matter who they are competing against, the coach has high expectations. McKenzie said it’s the Cornell community that makes this all possible. The team had lot of work to do for the competition. For this year’s tournament, the members only had a short time to prepare the Nationals case. “During the Invitational season, as well during Regionals and Opening Round Championships (ORCs), we have one case to work on and perfect for months. Once ORCs are over, however, we have only weeks to prepare an entirely new case with a new fact pattern, new law, and new witnesses,” Andersson said. 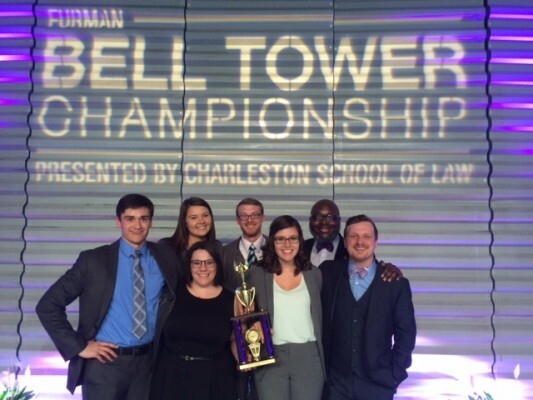 The National Championship was hosted by Furman University in Greenville, South Carolina and sponsored by the Charleston School of Law. Mock trial is an intercollegiate activity that combines speech, theatre, and debate. Cornell’s mock trial program gives students the chance to develop a better understanding of the courtroom process and the American legal system. Students learn to identify a problem, identify potential solutions to that problem, analyze and select the best solution, and persuasively present that solution. All of this takes place in the context of a fictitious legal case, but the skills translate to any profession. For more information, contact Cornell College Public Relations Director Jill Hawk at 319.895.4232 or email jhawk@cornellcollege.edu.